For Mac users to convert DOC(*.rtf; *.txt) into a Digital Flash Flip Book in seconds. Access your DOCs from iPad, Android, iPhone, and many more. Unlimited use desktop application. Add unlimited Documents. Publish DOC(*.rtf; *.txt) to multiple file formats (Flash\EXE\ZIP\HTML). Give a book-like appearance, and you feel like you are flipping a book. 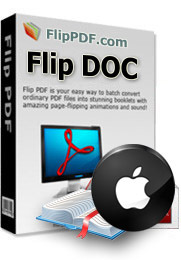 Flip DOC for Mac is an easy page flip softwarer to convert RTF and Text files into Flash page flipping books for online sharing, which is the best solution to turn doc into flash flippingbook for Mac users. Because Flip DOC for Mac has the ability to automatic generate swf files from RTF and Text and generate an HTML web page flipping books. Have you ever seen a ebook or e-brochure that can be flipped like a real book. Mostly its done with flash that requires a lot of action script knowledge and a good foundation in geometry to make the flip effect. That’s a lot of hard work. but with Flip DOC for Mac, No coding is required. Simply import your RTF or Text file, configure the look&feel and hit the publish button. At a Glance: Easy! Even a new user, you can use Flip Doc for mac within a couple of minutes without any special learning. 1. Customized Viewer Interface	: Customized viewer, allows you to change background and toolbar colors, add or remove graphics and features. 2. Import Logo : Import your company's logo directly into your digital edition. 3. Background Image	: Allows you to insert any image directly on the background of your edition. 5: Thumbnail Browser Interface	: Instant overview of the whole edition using small images. 6. Bookmark : Allows your readers to add bookmarks to your edition for easy reference and return to a specific page. 7. Printing :	Readers can print single and multiple pages of your digital edition. 8. Send as e-mail : You and your readers can e-mail the digital edition to friends, customers and business associates. 9. 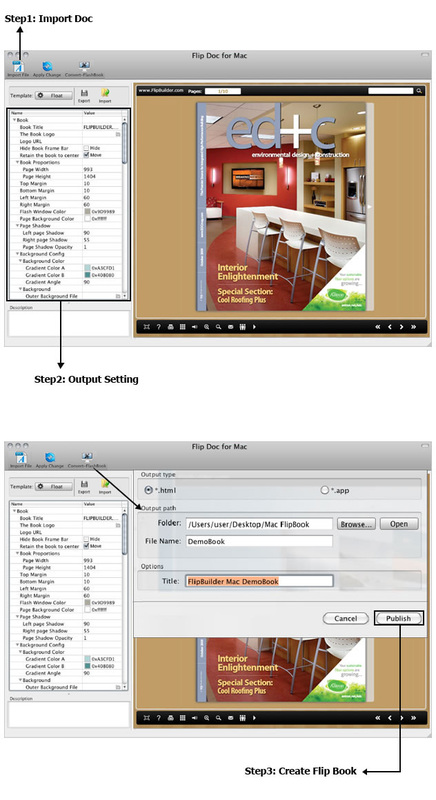 CD Version : Mail your digital edition on a CD/ DVD for your customers viewing and reference. 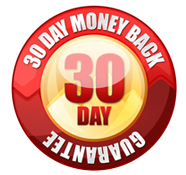 Save on paper and mailing costs. 11. Sharing on Email, Facebook, Twitter..
12. Download, Print, Fullscreen and Pageoverview controls. 14. Multiple Methods of Distribution - Online publications may be published from your personal Web server, embedded on social media, placed on a CD/DVD/USB device or embedded into e-mail for fast, effortless, and eco-friendly distribution. 15. Easy Navigation - Online publications look and read like traditional magazines with turn page. Search functions allow readers to find key words, phrases, or sentences; a convenient index and hyperlinks help readers locate information quickly; a zoom function keeps the pages crisp, smooth, and easy to read. With our easy to use interface, you can make a modern, user-friendly and attractive publications from traditional rtf and txt book documents in a few mouse clicks! Even a new user, you can use Flip DOC for Mac within a couple of minutes without any special learning. 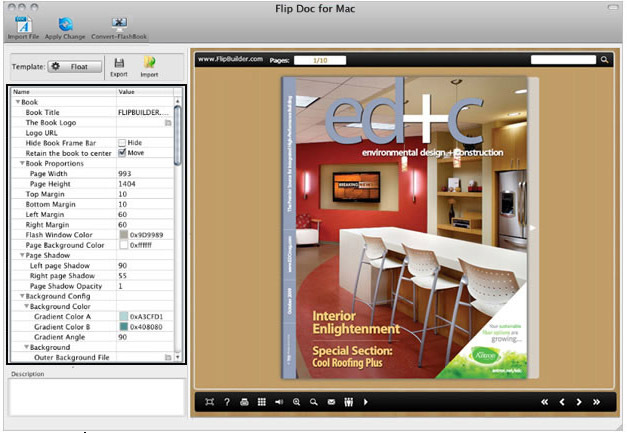 Beside Flash version, all publications created by Flip DOC for Mac will also include HTML5 version. The readers will be able to open your flip page publication in any environment (PC, Mac, iPhone, iPad, Android, or Windows Mobile), and you can even publish at your Facebook page. Flip DOC for Mac supports analyzing and importing table of contents from DOC bookmark. After that, you can edit the imported table of contents. If you want to create it by yourself, instead of importing from RTF or Text Book, or your DOC does not contain a table of contents, Flip DOC for Mac can help you to create table of contents for your digital publication. With Flip DOC for Mac, you can designate adjacent pages as the "Table of Contents". Here you can define a text link to each main category of your publication. The table of contents support unlimited links. 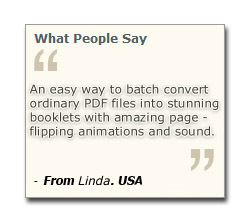 High quality Converting of RTF and TXT documents to web-ready Flash® Page Flip Books. Automatically create thumbnails for your convenience to view each flipping pages in the converted doc to flash magazine. Embed the FlipBook both on your website. An offline version can be generated automatically. Preview the real-time RTF or Text Book content (flipbook) effect imported.